Since long, road have been one of the safest and most efficient source of transportation. There are places which can’t be reached via airplane or ship, but can be reached through road. Roads are meant to lead us to our destinations, no matter whatever the weather condition or topography is. But there are some roads around the globe that are “Highway to Hell”. They are so furious in nature that they lead its travelers to death bed, instead of their destinations. These roads are death paths mostly due to their extreme locations in the mountains and remote terrains. The list below ranks the Top 10 most dangerous Roads in India. Connecting the Indian state of Sikkim with China, Nathu La is a mountain pass in the Himalayas. It is one of the three trade link between India and China. The pass is at 4,310 Meter above sea level and is one of the highest pass accessible via road. Nathu means “Listening ears” whereas La means “Pass”. The pass is extremely dangerous as it faces heavy snowfall during winters and also there are heavy landslides during Monsoon. Located in the southern state of Andhra Pradesh, Tirupati is one of the most renowned pilgrimages of India. The city is situated in the highlands of Eastern Ghats. Most famous temple here is dedicated to Lord Venkateswara, known as Venkateswara Swami Temple. Since Tirupati is situated at the foothills of Eastern Ghats, the roads to Tirupati are quite risky and prone to accidents. There are a number of loops and twists and steep roads on the way to Tirupati, which makes it one of the most dangerous roads. Mount Abu is a renowned hill station, situated in the barren land of Rajasthan State. The city is located at a height of 1,220 meter above sea level, and has a stretch of 22 kilometer length and 9 kilometer width. “Guru Shikhar” is the highest point at Mount Abu and in the Aravalli Range, which is 1,772 meters above sea level. To reach Mount Abu one has to pass through 28 Kilometer road which starts from Abu road. As the height increases the road to Mount Abu gets more dangerous at some places road is wide enough for only one vehicle to pass and mountain cliffs on one side. Munnar road is a 130 Kilometer pass, staring from Kochi to Munnar. Munnar is a Hill station in State of Kerala at an elevation of 1,700 meters above sea level. Munnar is located in the Western Ghats, in Idukki district. The road to Munnar is sharply winding, steep and also has narrow zigzags. The road is surely breathtaking and also has a fearsome reputation. The road is blind at places and there are a lot of trucks and buses driven recklessly. Also during night, thick fog starts blinding the vision and makes only a meter or two visible, even with fog lamps on. Listed in Guinness book of world records, Khardung La pass is believed to be the highest motor-able road in the world. Local inhabitants claim that its actual height is 5,602 meter while its actual height is 5,359 meters above sea level. It is situated in Ladakh region of Jammu and Kashmir State in India. These roads are not paved and are slippery due to the frozen ice and dirt mix. The road has a narrow trail with deep valleys on one side. There are steep drops along the entire route and weather conditions. At times, might make harsh conditions. Having literal meaning “Pass towards the South”, Chang La pass is the third highest motor-able route in the world. The pass is at an altitude of 5,360 meters, situated in Ladakh, India. The road lies in the way to Pangong Lake from Leh and is also the gateway to Changthang Plateau in Himalayas. It is 134 Kilometer in long and has a quite cold and chilling climate with less oxygen. The pass is covered with snow throughout the year. Rohtang Pass is at an elevation of 3,979 meters above sea level and is located on the eastern Pir Panjal range of Himalayas. The path is situated about 53 kilometers from Manali and is crossed by Leh-Manali Highway. It connects the Kullu valley with the valleys of Lahaul and Spiti. The meaning of Rohtang, “Ground of Corpses”, itself suggests the dangers associated with it. 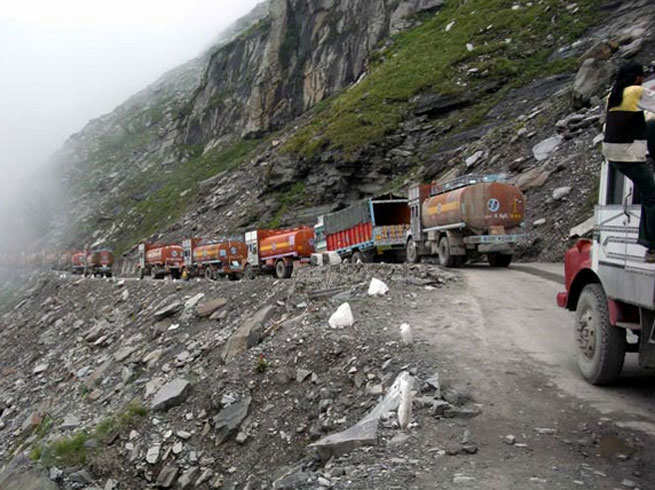 The pass encounters huge inevitable traffic jams and is usually open from May to November. The path could be closed for infinite time due to heavy snow fall with constant sliding of hills and rain, the road gets covered with slush. At an altitude of 3,538 meters above sea level, Zoji La Pass is one the important and most dangerous mountain pass in the India. The pass is traversed by Srinagar-Leh Highway. The road is very narrow and easily gets muddy during rains and becomes impassible during or after Storms. The heavy snowfall, violent winds and frequent landslides make it one of the riskiest passes in the Himalayas. The Leh Manali road is a dirt gravel road that connects Leh in Jammu and Kashmir to Manali in Himachal Pradesh state and spans over a length of 479 kilometer. Glacier Melts, broken patches and water crossings make the road one of the riskiest ever highway. The snowy road is surrounded with Rocky Mountains on both sides which make it prone to heavy landslides. The road faces never ending traffic jams, that makes the journey more complicated and as well as challenging. Kinnaur is one of the districts in Himachal Pradesh, India. The district is located in the southwestern part of the state and also borders Tibet on its eastern end. 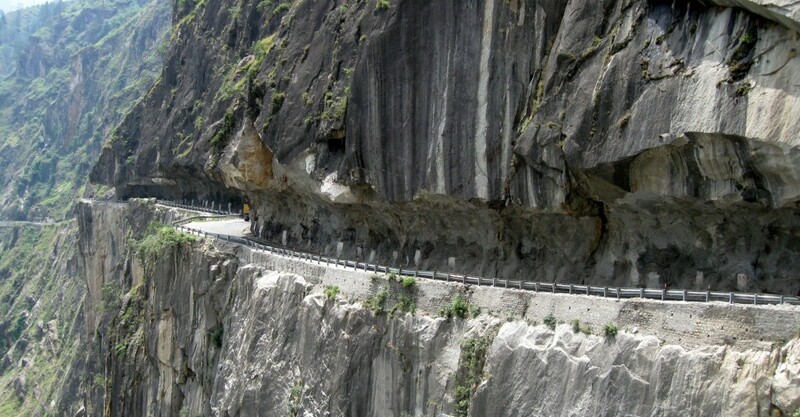 To make it accessible and link to rest of the country, Kinnaur road has been cut into hard rock’s to make a road. At some places the road is carved out of sheer precipice and roads suddenly become narrow and deadly at the start of Kinnaur. The roads take curvy and blind turns as it approaches Kinnaur.